Click on the image to open a slideshow of the soft top MX-5. Okay, that may be an exaggeration about the old British sports cars, but I've owned three MGB's (in various states of repair from "on its last legs" to "brand new") and they all left me on the side of the road - so much so that I look back now, decades later, and find it hard to believe I could have been so stupid as to get kicked by that particular mule three times. What can I say? I was a kid. On the other hand, if it weren't for my brand new, 1975.5 B I wouldn't have discovered the Honda Civic hatchback I swapped straight across for the MG. That was the last European car I owned until I got my current one about four years ago. Ah, the circle of life! A while back Mazda decided to start calling the MX-5 Miata the MX-5 (as an old fart, I still think of it as the Miata, though) but the car continues to delight in this, its fourth generation. This version has been out for a couple of years now but Mazda Canada's sample MX-5 RF in which I just spent a week is the first time I've had a chance to try it. And I was very nervous. The angst came from the fact that this generation is down on power compared to the last one: 155 horsepower from the current two litre Skyactiv four banger compared with 167 in the last Mia-er, MX-5 I drove. Thank the Obama/Gore/Suzuki clan and its sycophants for forcing carmakers to focus on upping the fuel mileage for such things, which causes carmakers to try making their vehicles lighter while they also have to contend with airbags and sundry other safety features they're forced to install, all of which add weight and complexity. Can you tell I love this car? 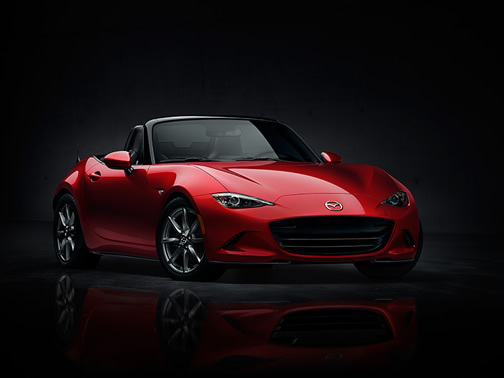 New for this year is a retractable hard top (well, partially retractable) that makes the MX-5 a truly great all season ride instead of merely a fair weather friend. And as with the previous retractable hardtop, it doesn't rob you of any trunk space - not that there's any to spare anyway. This top, which is more like a Targa top than a truly retracting roof (resulting in more of a "big sunroof" than a true drop top), adds weight and complexity, but it works beautifully. Alas, unlike the old retractable hard top, doffing the hat doesn't give you a wide open driving experience because most of the roof is still there - it's just the part over your head that opens. This brought me to another soul searching moment: I'm not a convertible guy so would tend to prefer the hard top anyway, but this new one leaves you with all the blind spots to the side and back that the raised top (hard or soft) has. So in this instance I preferred the old retractable top, even though I liked practically everything else about this new version better. Proving, once again, that some people are never happy. Operating the roof is easy, thanks to its clever design and the easy to reach switch at the bottom of the centre stack. The switch operates backwards to what I'd thought would be logical (you press up to open the roof and down to close it) but it's easy, and you don't even need to unlatch anything beforehand. It's cool enough that my three year old grandson cackled with delight when he saw Grandpa's "Transformer" in action. Indeed, that cool roof, besides explaining the "RF" terminology, makes the little critter well, optimally prime. I think Mazda has lost a bit of the car's cuteness with the new exterior, but it's modern and attractive anyway. The front features slit-like headlights that make the car's nose look like a squinty (but cute) face. The body work is relatively voluptuous, ending with a bum that's reminiscent of Jaguar's gorgeous F-Type. The interior is a tad Spartan, but this is supposed to be a classic sports car so I'll cut it some slack. Mazda's sample didn't have automatic climate control and Mazda's currently typical console-mounted volume control turns out to be a tad far back to reach easily in the tiny cabin (fortunately it's duplicated on the steering wheel) - and the cup holders mounted at the back of the console are very impractical unless you're a contortionist. I didn't measure dimensions, but this current MX-5 seems a little more roomy than the previous ones - and I'm pretty sure my buttocks and shoulders haven't shrunk over the past few years. This is very welcome because the older ones were quite cramped - and I'm only five foot six (height and width). The MX-5's fuel mileage amazed me. I have a lead foot and usually go through gas in an MX-5 like it's a pickup truck. With this new one, however, the gauge stayed stuck on full so long I started to wonder if it was broken. It wasn't, and after my week of driving the car as hard as I could want to, it only cost me $17 (at $1.04/litre for premium) to fill it up. The seats (Recaro in Mazda's sample, thanks to its $4400 optional Sport package) are very comfortable and hold you nicely when you hit the curves you're sure to seek out with a car such as this. Pedal placement and feel is wonderful and the six speed manual transmission (you can get an automatic with paddles for the same price, but don't) is the smoothest I can remember in a Mazda. I love Mazda's manuals, but usually find it challenging to shift them smoothly; there was no such issue in this MX-5. Besides the roof, there isn't a lot that's new for 2017 and that's okay. The $31,900 base GX is unchanged, but for that price you still get such stuff as push-button start (no proximity lock/unlock, though), auto leveling LED headlights with light signature, LED rear combination lights, air conditioning, Bluetooth, and cruise control. The audio system features six speakers, including ones in the driver's headrest that makes it sound as if God is singing to you - or would sound like that if the speakers were better. But if you buy this car for its audio systems you're nuts, especially if you plan to drive with the roof down. Better to groove to the tunes emanating from under the hood and out of the exhaust pipe. The mid-level GS, which starts at $35,800 CAD, ups the suspension's sportiness ante (double wishbone up front and a multilink rear) via Bilstein shocks, limited slip differential, strut tower bar, and induction sound enhancer (manual transmission only). It also gets blind spot monitoring and rear cross traffic alert, which are handy, as well as rain-sensing wipers, a seven inch touchscreen display perched atop the centre stack and automatic headlights. Besides the heated leather/Alcantara trimmed Recaros, the abovementioned Sport package also gets you handsome 17 inch forged BBS wheels and Brembo front brakes. Mazda's sample also featured a really great Soul Red paint job that costs an extra $300. I'd spend that, as well as the four grand for the Sport package. The problem then is that you're getting into some serious coin for what's mostly a toy. Mazda's sample tipped the fiscal scale, sans taxes and other gobs of flesh, at $43,500 CAD. And that's not even the top-line GT livery! The GT starts at $39,200 and gives you all the GS' goodness, with such luxury touches added as heated leather seats, a Bose premium audio system with nine speakers, automatic climate control, lane departure warning, adaptive front lighting system and high beam control. These prices, by the way, are for the soft top version. If you want the Retractable Fellow (Mazda says RF actually means "retractable fastback" even though it isn't really a fastback), its base price is $38,800. It's only available on the GS and GT trim levels, too, with the GT adding about four grand to that total. You can spend another $4500 on options, too, if you choose. I'd love to drive a Toyota 86 and the MX-5 back to back (I last drove the 86, then the FR-S, in 2012) because I think I'd have a heckuva time deciding between them. Both are rear wheel drive, front engine cars but the Mazda's more of a pure sports car while the 86 is a great little 2+2 GT car. The Toyota is cheaper, too, though you can't get a convertible version. All 2017 MX-5s come with Mazda's Unlimited Mileage Warranty, which covers all parts found to be factory defective for three years, regardless of the number of kilometers driven. It also covers the powertrain components for five years, unlimited mileage, body sheet metal perforation for seven years, and tosses in roadside assistance for three years, unlimited mileage. Price angst aside, I truly love the Mazda MX-5 and still haven't stopped smiling about the driving experience. It's a wonderful car.